I can’t think of a better time to decorate your windows with suncatchers than during the winter months. 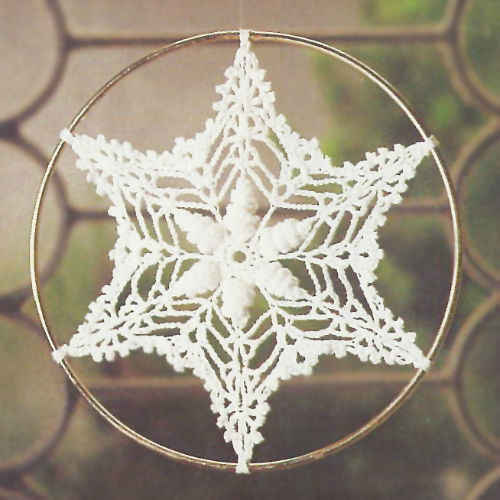 This suncatcher is created with crochet cotton thread and a steel crochet hook. 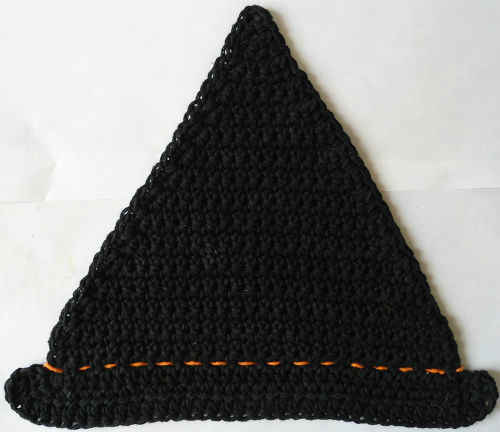 The center shells are created with multiple double crochet stitches worked in the same chain. This technique causes a curling effect. After completion of the lace piece, the tips are attached to a brass ring. Materials: Size 10 Crochet Thread: White – 75 yards; Brass Ring – 8″ diameter; Thread Needle. Double Triple (dtr): Yo hook 3 times and insert hook into st or sp indicated. Yo, draw lp through st or sp. (Yo, pull through 2 lps on hook) 4 times. SHELL: (V-st, ch 2, dc, ch 5, dc, ch 2, V-st) in same st or sp indicated. SHELL2: (V-st, ch 2, V-st, ch 5, V-st, ch 2, V-st) in same st or sp indicated. Rnd 7: Picot, sl st in same st as joining, ch 3, (sl st, picot, sl st) in next ch-2 sp, ch 3, skip next 2 dc, (sl st, picot, sl st) in next dc, ch 3, skip next 2 ch, (sl st, picot, sl st) in next ch, ch 3, (sl st, picot, sl st) in next 3 ch-2 spaces, ch 3, (sl st, picot, sl st) in ch-5 sp, ch 3, (sl st, picot, sl st) in next 3 ch-2 sps, ch 3, skip next 2 ch, (sl st, picot, sl st) in next ch, ch 3, * (sl st, picot, sl st) in next dc, ch 3, (sl st, picot, sl st) in next ch-2 sp, skip next 2 dc, (sl st, picot, sl st) in next dc, ch 3, skip next 2 ch, (sl st, picot, sl st) in next ch, ch 3, (sl st, picot, sl st) in next 3 ch-2sps, ch 3, (sl st, picot, sl st) in ch-5 sp, ch 3, (sl st, picot, sl st) in next 3 ch-2 sps, ch 3, skip next 2 ch, (sl st, picot, sl st) in next ch, ch 3; rep from * around, join with sl st in first ch of first picot. (72 Picots) Finish off and weave in ends. Maggie, this pattern has inspired me to make several of these Suncatchers to hang outdoors on our patio. I think I will incorporate glass bead in various colors as well as the clear ones. Always looking for new project. Thank you for creating this one.